It's no secret the Greater Philadelphia Area is known for its private school curricula, as evident by the number of its prestigious private institutions. With so many to choose from, the process can feel overwhelming for both the prospective student and their respective parents, which is where Suburban Life / Philadelphia Life’s annual Private High School Report Card comes in. We spoke directly with several area private schools to gather the most up-to-date statistical data in an effort to present the most accurate information. That data spans key categories from tuition cost, student-to-teacher ratio, percentage of students attending a four-year college and numbers of both AP and Honors classes available. Additionally, we gathered information on average SAT scores by asking the schools, as a matter of fairness, to provide their average score for 100 percent of the student body taking the test. If the schools only provided a select percentile, rather than the average, we have omitted their scores. Finally, a few local schools offered advice for both students and parents on how to better prepare themselves when applying to their school of choice. To see the full 2017 Private School Report Card, click here. What do you look for in a prospective student? “The enrollment process is not about ‘looking’ for prospective students. It's more about finding the right fit for the student and for Holy Ghost Prep. Every student comes from a different grade school, family, neighborhood. He has lived different experiences, played on different teams, traveled to different places, met different people. Each student brings with him a story. As an applicant, we want for that boy to tell his story. … Often, that translates into something easy to see: solid grades, a great work ethic, a strong entrance test score, outstanding teacher recommendations and a charismatic interview—all of these components are part of the application process and are key factors in being admitted. What should parents consider when deciding what private school would be the best fit? How important are test scores when admission decisions are being made? 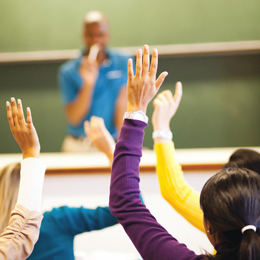 How important is it for a student to visit a school and sit in on a class prior to applying?